Apple’s CEO Tim Cook recently made an interesting announcement about the new Apple Park — at Apple Park, everyone gets a standing desk. Some of it is because most employees have an Apple Watch, so about 10 minutes on the hour, employees are standing up anyway. Aside from that neat tidbit, it’s just better for your health — Cook himself has cited doctors going on about just how bad sitting is all the time. With that in mind, you might be encouraged to change your sitting and standing habits as well, and you can do that with your very own standing desk! However, you may not have the cash to invest in a standing desk, as they can get quire expensive. That’s where a standing desk converter comes in. 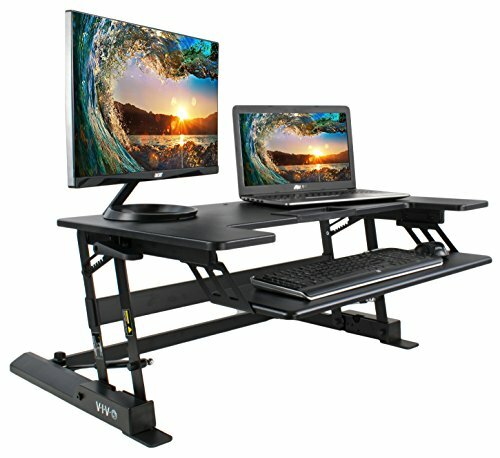 If you follow along below, we’ll show you the top 5 best standing desk converters on the market! This desk converter comes in three colors: black, cherry, and maple, making it the perfect converter no matter what color desk you have. It’s design is both modern and sleek, providing you with style as well as overall functionality. And, this is a converter you won’t even need to assemble, as it comes built to use straight out of the box. 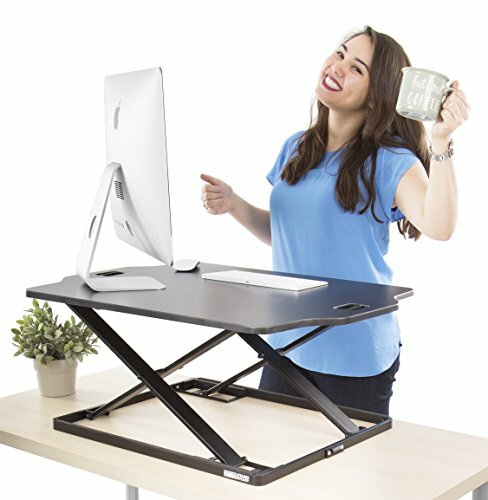 Because this is an adjustable converter, you can increase the height as much as necessary to create a standing desk experience, but you can also keep it compact and use it as a tray or writing desk. And while the maximum weight for this to hold is 20 lbs., it’s big enough to hold two monitors, or a laptop and all of your favorite desk accessories that you don’t want beyond arm’s length. Unlike the previous converter, this one is not merely a single table top desk converter. This converter actually has 2 levels. One for your monitor (or two), and one a little lower that is specifically made for your keyboard. This will ensure that your wrists will always be at a comfortable distance from the screen, and is especially great if you want that screen a bit higher up. VIVO’s desk converter comes in 2 basic colors: black and white. However, I should note that we’re talking about the manual desk here. This one, you’ll be able to adjust manually to fit the height that you need. However, if you’re willing to spend just a bit over $100 more, you can get this in the electric version, which will adjust at the touch if a button. Perhaps you’re looking for something functional, that will work great without spending a ton of money. That’s where this one from Executive Office Solutions comes in. You’re going to get a great, quality desk converter for less than $50, which is really a fantastic deal. This is designed more for a laptop, and not necessarily a heavy duty monitor, but works in many different ways. First off, you can use this as advertised: a desk converter. Once you put this on your desk and raise the height, you’ll have a standing desk in no time flat. But that’s not the only way to use it. 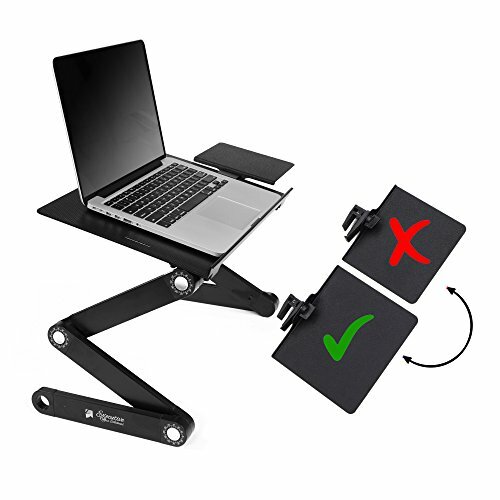 If you like to browse on your laptop before bed, you can actually set this over your legs for a lap desk that won’t have your device wobbling or crashing to the floor. Do you have a dual monitor? Or perhaps a laptop hooked up to a monitor for ease of use? 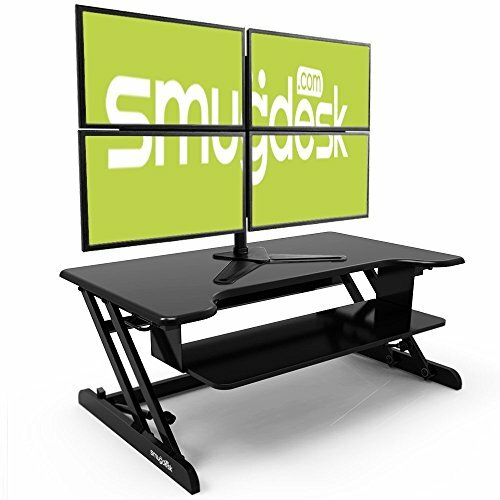 Whatever the case may be, this standing desk converter by SmugDesk is a great option for you if you typically have a lot going on at your desk. It’s long enough for two monitors, two laptops, or a laptop and a monitor together. 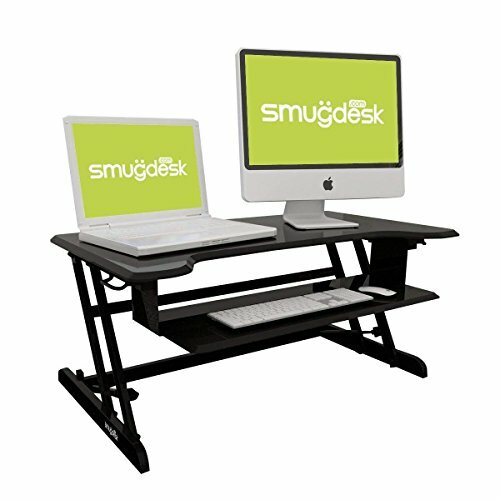 So however you like to work or game, SmugDesk has created this product with exactly that in mind. Another neat thing about this desk is that there is no assembly required. Similar to the one by Stand Steady, you’ll be able to order it, open it, and start using it right away. There’s no parts to keep track of or instructions to follow, so if that’s not your thing, then perhaps this desk converter is totally your thing. Another one with one of our favorite features: no assembly required. This great desk converter by Halter comes preassembled and ready to use. This one will easily convert if you decide you want to sit back down, and provides plenty of space for up to 2 regular sized monitors. One of the really neat things about Halter’s desk converter is that it comes with cable control. If you’re the kind of person who hates dealing with a mess of tangled cords or even just the aesthetics of how unsightly they can be, this may be just the choice for you. With specially designed areas to tame your cords, you won’t have to deal with them ever again. And that’s all there is to it! 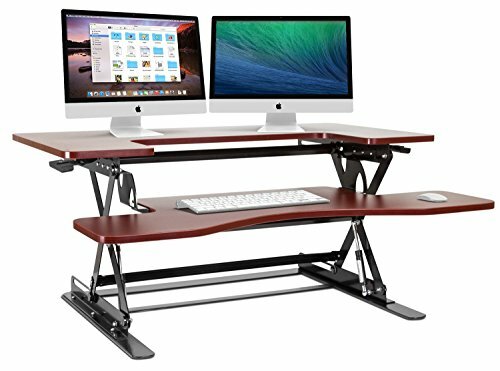 All of the standing desk converters on this list are perfect for those that are interested in changing up their office life. Which one is your favorite?